If you’re not already familiar with the magical world of Ozric Tentacles then the first question would have to be “where have you been?”. For over 30 years Ed Wynne has led his merry band out to the far reaches of space, discovering new worlds and generally spreading good vibes. They formed at the Stonehenge Festival in 1983 so that should give you some idea of the mindset. The trance-like nature of much of their music has a spirituality about it and the hippy vibe is never far away, but with playing and production of such a high quality there is always a cutting edge that is refreshing. Even their early albums still sound ground breaking underlining how they started out with a great plan and have relentlessly ploughed the furrow since, consistently turning up gold. Many of the albums may be almost interchangeable, however they always make me smile and this time is no exception with influences from funk, jazz fusion, dub reggae and ambient music. If you have heard the Ozrics before then you won’t need much in the way of a description. They sound like the Ozrics. For the uninitiated, think of a layered soup of sound, sweeping keys, electronic bleeps and clicks, pulses on a repetitive cycle, driving rhythms and soaring guitars. Ed’s guitars have always been central to the sound, together with Eastern rhythms and the deft layering of the batteries of keyboards and synths, and he is to be commended for forging a cottage industry career that has prospered ever since. There is an inscrutable mysteriousness to the sounds, the rhythmic pulses and trance elements would sound brilliant in a church and the spiritual elements would be at home there too. There is no point in picking out any particular tracks or describing them in detail but for an hour and a half the Ozrics will transport you to a mystical alternative universe from which you will return refreshed, tracks with titles like Butterfly Garden, Epiphlioy, Zingbong, Zenlike Creature and Rubbing Shoulders with the Absolute doing what you’d expect them to, the latter with a massive chillout groove. This time the core trio of Ed, wife Brandi and son Silas are joined by drummer Balázs Szende and percussionist Paul Hankin. 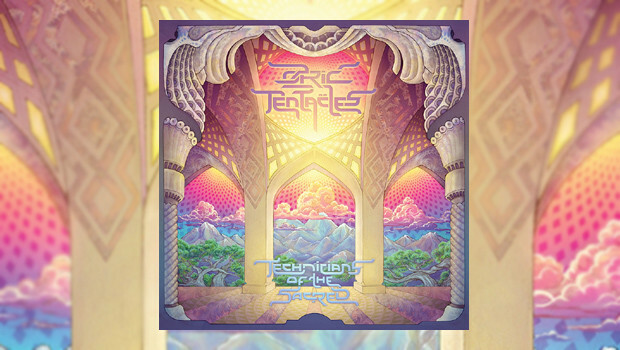 Technicians of the Sacred, a full four years on from their last studio album Paper Monkeys, is a very strong Ozrics release and as good a place to start as any if you have yet to dip your toe into their music. Do so and be forever blessed. It’s a lengthy release and their first double studio album since the classic Erpland in 1990. The wide-eyed enthusiasm is still in place, driving the music and holding the fans in thrall as tracks are given full rein to run their course. As a result they are all weighty slabs of wizzy rhythms, beautiful and affecting and underpinned with a primalism that does not get tedious. There is just too much to enjoy here. Now resident in the USA, their home and studio was unfortunately destroyed in June 2012 by the wildfires that ravaged Colorado. The band were on tour at the time and lost their archived material, studio and some instruments and this album is a testament to the fan support that allowed them to rebuild and continue, the good vibes now being returned. Three years on from the disaster they are back and firing on all cylinders with another wonderful release that emanates fun and happiness. The “can do” attitude has stood them in good stead and remains an inspiration. There are times when only the music of Ozric Tentacles will do. The cleansing properties and positive waves are like a tonic and so there’ll always be a warm and fluffy place for them within my listening habits. And they’re a blast live, go and see them.